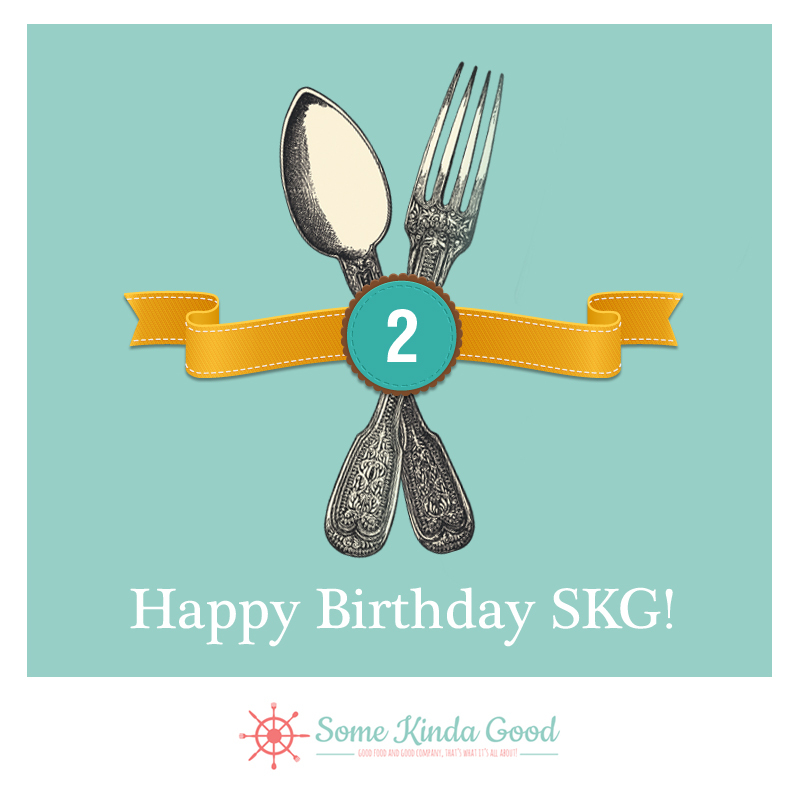 Happy Blog-iversary to Me: Year Two! Some Kinda Good is two. 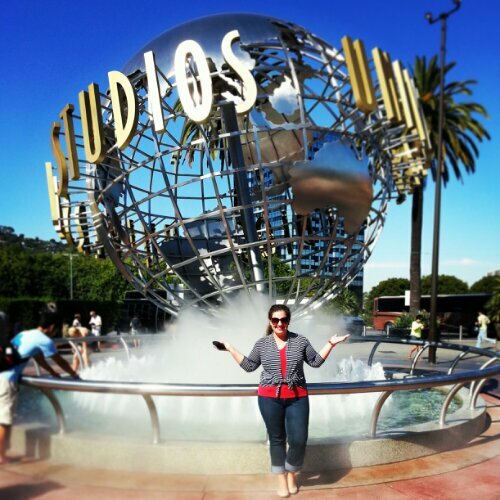 Happy Blog-iversay to me! The year 2013 has been filled with amazing opportunities, complete with my local TV debut on Statesboro Cooks, lots of feature writing, live cooking demonstrations, volunteering and more. What a year! 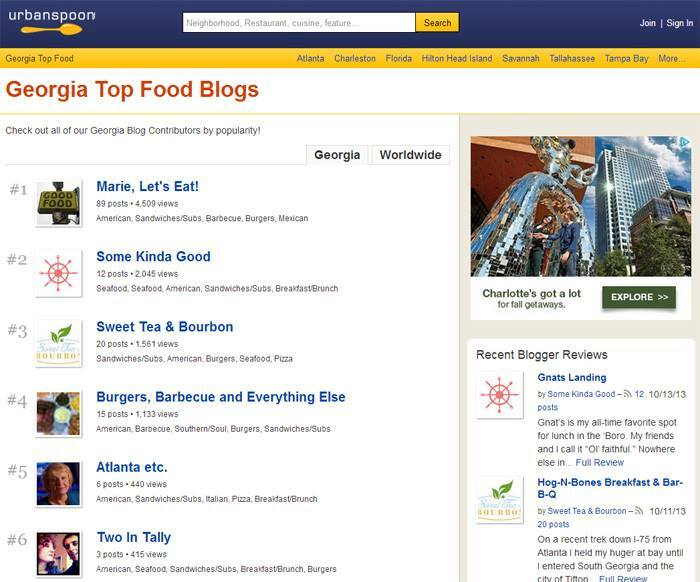 Some Kinda Good has held the #2 ranked spot on Urbanspoon’s Leaderboard of Top Georgia Food Blogs since April 2013. I became a guest blogger for Visit Savannah, and my local work is also featured on the Visit Statesboro website. 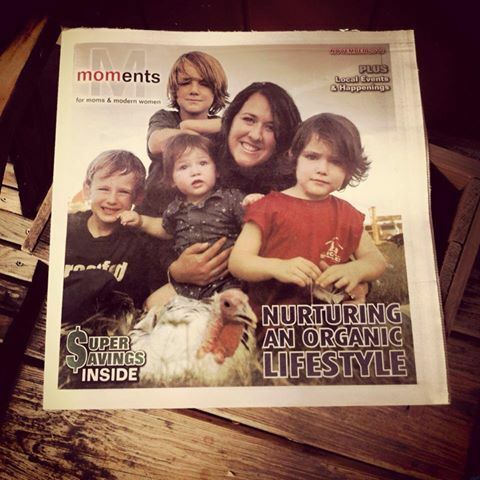 I got to write the November Cover Story for Moments Magazine, featuring Hunter Cattle Company’s Kristan Fretwell. May 19, 2013 – A proud day. My first published food column. 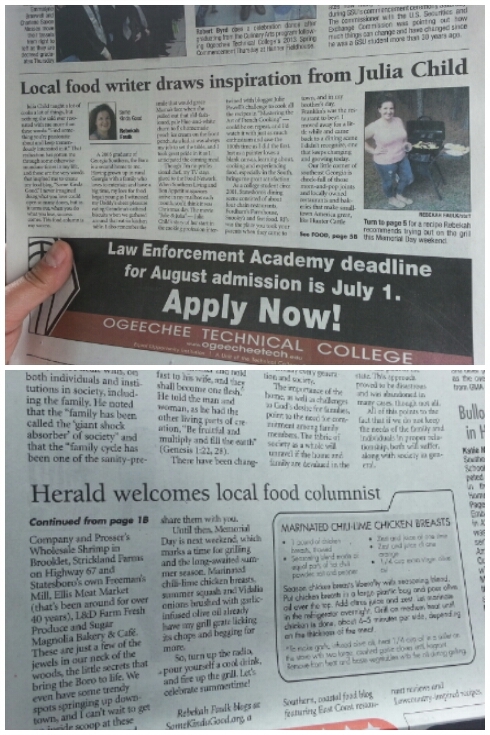 I became a food columnist for the Statesboro Herald in May 2013. I had the opportunity to co-produce and host two episodes of Statesboro Cooks, a local, cable TV cooking program in June and November this year. 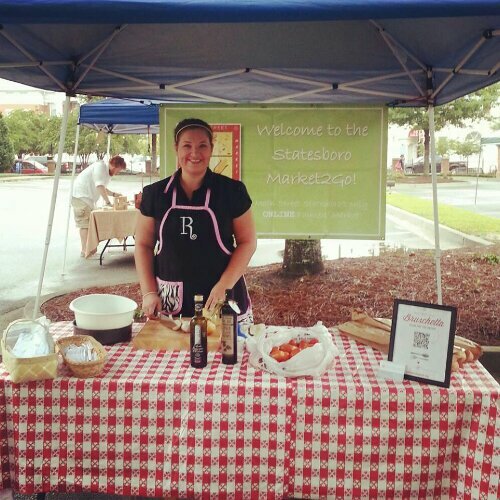 I was invited to be the Celebrity Chef at the Statesboro Main Street Farmers’ Market on August 17, 2013. What a blast! In August, I appeared as the Celebrity Chef at my local farmers’ market, where I performed a live cooking demonstration serving up Summer Bruschetta. Perhaps the most exciting adventure this year has been auditioning for The Taste on ABC in L.A., Calif. Premiering on Jan. 2, 2014 at 8 p.m., the cooking competition reality show is sure to be entertaining. I hope you’ll tune in to see how my Hollywood experience plays out! Since its inception in Nov. 2011, Some Kinda Good has reached nearly 37,000 hits. Though it’s a lot of hard work, blogging has proved to be a wonderful, creative outlet and platform for me. My success wouldn’t be possible without you, and my dishes wouldn’t be as delicious without Georgia Farmers! I sincerely thank you, my blog followers, for reading and sharing my little piece of the World Wide Web with your friends and family. Thanks for your encouraging comments, and all your “likes” and re-tweets. Not a single one has gone unnoticed. To my farmer friends, chefs and restaurant owners, thank you for making Southeast Georgia the finest place to exist. I especially thank Julia Child who said, “Find something your passionate about and keep tremendously interested in it.” As it turns out, that philosophy has served me well. 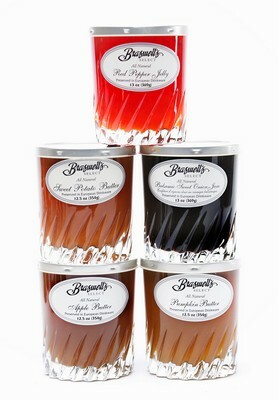 Braswell’s Gourmet Holiday Gift Set includes pumpkin, apple and sweet potato fruit butters, and Balsamic Sweet Onion Jam and Red Pepper Jelly. Some Kinda Good approved! I couldn’t think of a better way to show my appreciation for your support than to share with you food products from one of Statesboro’s own gourmet businesses. Braswell’s has been making specialty preserves, condiments and sauces for almost 70 years. Valued at $35, the set includes an assortment of Braswell’s most popular fruit butters and hors d’oeuvre jellies, perfect for entertaining this time of year! For your chance to win, choose from the options below. You do not have to be local to participate, but must reside in the United States. 1) Comment on this blog post with your favorite and most memorable Some Kinda Good post, explaining why you chose it. If you’re new to Some Kinda Good, tell me how you came across my blog. 3) Like and share Some Kinda Good on Facebook (or just tell me you already do if that’s the case)! Contest ends on Friday, Nov. 29 at 11 a.m. EST. I’ll email the winner and announce the recipient on the Some Kinda Good Facebook page. The gift set will be mailed directly to your home. Disclosure: I received one Braswell’s Gourmet Holiday Gift Set valued at $35 to celebrate Some Kinda Good’s 2nd Birthday. Update: 11/26/13: In addition to the Braswell’s Gourmet Gift set, the winner will also receive one fresh baked loaf of bread from Sugar Magnolia Bakery & Cafe!